Whether you love the holidays or can’t wait for these months to be over, there is no denying that the holidays bring all of the best treats! From toffee and eggnog to pumpkin pie and gingerbread, there is a never-ending supply of tasty treats that even the Grinch couldn’t resist. These goodies may put a smile on your face, but they may not keep that smile healthy! There are always different foods and drinks that are harmful to your teeth, no matter the time of year. But the holidays bring an entirely new lineup of goodies that makes dentists everywhere cringe! So, instead of being the scrooges of the holiday season, our team at Brookside Dental Care is simply going to inform you of the worst holiday treats for your teeth! If you want to keep your teeth healthy this holiday season, be sure to avoid, or at least minimize, your consumption of these treats. This is one holiday treat that some people wait all year for. The spiced drink may be delightful to the taste buds, but your teeth are not enjoying it quite as much. Eggnog is full of sugar, fat, carbs, and cholesterol. The high amounts of sugar are what make this drink bad for your teeth. We have mentioned multiple times why sugar is a tooth’s worst enemy. If you do drink eggnog this season, be sure to limit yourself and rinse your mouth out after you finish, this will wash some of the sugar out of your mouth and away from your teeth! Candy canes were originally made to decorate the home, and dentists everywhere wish that was still their sole purpose. Now candy canes are enjoyed all winter long! So, why are candy canes bad? Well, they are made with sugar, corn syrup, and food coloring. Sugar and corn syrup are not good for those pearly whites! If you want to keep your teeth healthy during the holiday season, candy canes are one of the main things you should avoid. Gingerbread is a great holiday treat that we all love. But it is still not the best for your teeth. Gingerbread is full of sugar and starchy carbs. This can lead to cavities and bad bacteria in your mouth. However, gingerbread is a better option than some treats. It can have less sugar than other goodies and is low in fat. So, if you must eat some sort of holiday treat, gingerbread is the lesser of two evils. Peanut brittle and its harder cousin, toffee, are two other treats you should avoid. Not only are they jam-packed with sugar, but they are also hard on your teeth. They are literally hard candies, and they can be sticky. Those are two things that should be avoided when you are trying to keep your teeth healthy. Hard and sticky candies can cause more harm to your teeth than they may be worth. While popcorn is not the first treat you picture when you think of holiday goodies, it is a popular choice this time of year. The chocolate covered popcorn and the tins with three popcorn flavors and household favorites! When it is covered in sugary chocolate or caramel, it is not the best choice. Plus, the kernels can get lodged in your gums and remain there for a while, especially if you are not one to floss regularly. Unpopped kernels can also damage or even break your tooth! 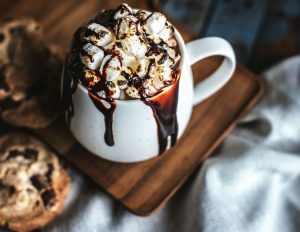 Hot chocolate is a great drink to enjoy during cold winter months after a day of sledding. But it is not great for your teeth. First of all, it is full of sugar. Second, the chocolate can actually stain your teeth. While this is not a serious issue, you may begin to notice that your teeth are not as white as they were at the beginning of the holiday season. We did not mean to put a damper on your holiday by telling you that all of your favorite treats can ruin your teeth. There are a few good alternatives that can help your teeth. A cheese platter is a great option since it has calcium and can help with your mouth’s pH balance. Also, natural peppermint flavor is great! Add it to tea to enjoy this holiday flavor while still keeping your teeth healthy. 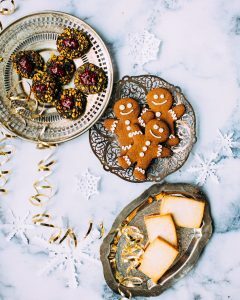 Trust us when we say that even dentists do not avoid these holiday goodies all together, but when you do eat them, be sure to brush those pearly whites extra well that night! After the holidays are over, you can schedule an appointment at Brookside Dental Care for a cleaning to get your teeth back in tip-top shape! Contact us today to learn more.